Sun room studio set-up for video shoot. I recently assisted my long-time collaborator Gary MacLeod with a new video project, acting as videographer and editor. 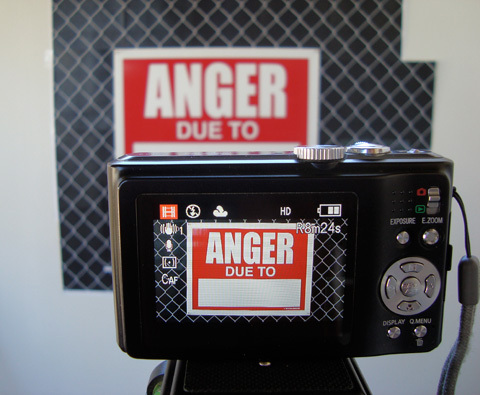 Gary had been commissioned by Art In Transit to create 10 eight-second videos to be broadcast on a downtown Toronto LED billboard during the 2014 summer. The videos, part of the Sign Me Up program, are seeded amongst the regular advertisements on a billboard at the busy downtown corner of Yonge and Richmond streets. This is a great opportunity for Gary’s sign-based art to reach thousands of eyes and create unexpected dialogues. Gary has a long history of incorporating signs and signage in his art practice, and these videos are a transformation of an evolving street intervention project. I am obsessed with manipulating signs and editing their meanings. When I see those oh-so-present “DANGER DUE TO:” signs. I really see “ANGER ANGER DUE TO:” signs and immediately want to write in a thousand different words and reasons in that blank box space. 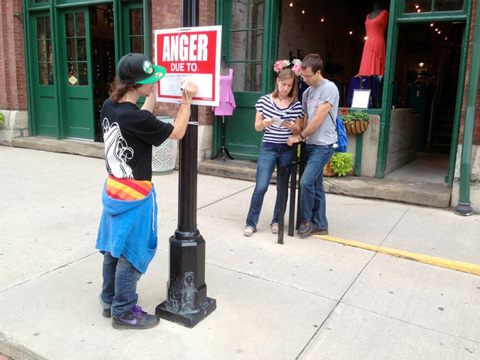 Anger Due To, installation, Distillery District, 2013. For the video project, we built a replica chain link fence with tiled sheets of A4 paper in Gary’s sun room. I videoed 20 Gary’s hand writing 20 words (he had narrowed down out of dozens). With the input of PATTISON OneStop’s Sharon Switzer, we honed the videos down to the 10 that will be shown from June 1to August 30, 2014. NIGHT THING, a one-minute film directed by my friend and fellow artist Gary MacLeod, is screening as part of the Toronto Underground Film Festival (TUFF). I built NIGHT THING’s graphic elements and edited the film. Gary MacLeod‘s art is usual based around actual neon signs he builds. The concept of NIGHT THING would require require over 100 signs, which time and cost prohibits. So I built a digital template, based on an actual neon sign, into which any word could be typed. 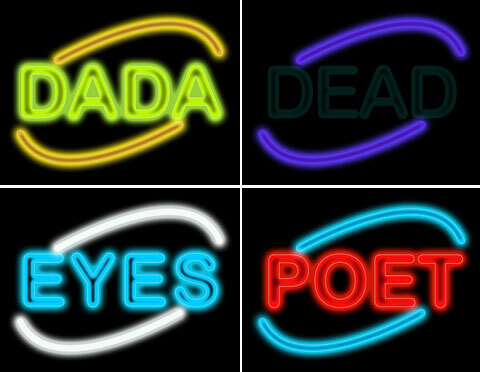 Then I animated the words into the flashing sign you see in the film. Screening Room: Next weekend (11 a.m. to 5 p.m., September 13 – 15), all the films (including NIGHT THING) will be projected in a 67 minute loop in Room 222 at the Drake Hotel. Grab a drink, relax, and enjoy some of the best ultra-short short films around. Admittance is FREE.